Constangy, Brooks, Smith and Prophete, LLP is pleased to announce the election of Andrew Eisenberg, a partner in our Boston office, as a fellow of the College of Labor and Employment Lawyers in the class of 2018. Those selected to the college must uphold the highest professional qualifications and ethical standards, as well as exhibit strong scholarship, teaching, lecturing and/or writing, along with leadership of no less than 20 years. Election as a fellow is the highest recognition by one’s colleagues of sustained outstanding performance in the profession and a demonstration of integrity, dedication and excellence. With the current installation, the college is represented by more than 1,400 members in 46 states, the District of Columbia, Puerto Rico and eight Canadian provinces. Eisenberg’s practice encompasses all aspects of labor law, labor relations and employment law, including responding to union organizing campaigns; negotiating and advising clients with respect to the administration of collective bargaining agreements; and representing clients in grievance and arbitration proceedings. He also assists clients with respect to the full range of employment issues, including discrimination claims and compliance with federal and state employment laws. Eisenberg frequently conducts management training programs and speaks to groups on a variety of subjects relating to labor, labor relations and employment issues. He represents both union and non-union employers in a variety of industries, including education, food processing and distribution, retail, architecture/engineering, banking and financial services, transportation, public transit, hospitality, high tech, and manufacturing. He is a graduate of the Columbia University School of Law and received his undergraduate degree from Brown University. Constangy, Brooks, Smith & Prophete offers a wider lens on workplace law. We have counseled employers exclusively since 1946. 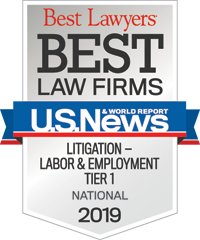 With offices in 15 states, we are one of the largest labor and employment law practices in the U.S. Constangy has been named as a top firm for women and minorities by organizations including Law360, the National Law Journal and Vault.com. Many of our more than 180 attorneys have been recognized by leading authorities such as Chambers & Partners, Best Lawyers in America® and Martindale Hubbell. Find out more about us online at www.constangy.com or follow us on Twitter @ConstangyLaw. The College of Labor and Employment Lawyers, headquartered in Washington, D.C., was founded in 1995 on the 60th anniversary of the National Labor Relations Board and the 30th anniversary of Title VII and Executive Order 11246. The college began as a nonprofit professional association honoring the leading lawyers nationwide in the practice of labor and employment law. It has evolved to become an intellectual and practical resource for the support of the profession and its many audiences. The primary purpose of the college is recognition of individuals, sharing knowledge and delivering value to the many groups that can benefit from its value model.